As a generation expected to surpass the number of baby boomers in the U.S., millennials are a target audience for businesses and advertisers. Known for being career-driven, educated, and progressive individuals, millennials are clearly making their dent in the workforce. A key part of the Millennial generation is their dedication to brand loyalty. Despite popular belief, 60 percent says they’re loyal to their current brands. What this means for brokerages is the sooner you can develop a relationship with this age group, the more likely they’ll stick with you. When it comes to real estate, millennials are hard-working and willing to go the extra mile to help you develop your company. In addition to this, millennial buyers are more likely to work with millennial agents, giving them an edge as more younger buyers are making their way into the market. Create a company image that attracts millennials. They prefer sleek, clean websites to the bulky, text-heavy designs. Make sure your site is fresh and up-to-date and incorporates social sharing widgets. When it comes to blogging, millennials need to trust the company before they’re willing to turn to the resource. According to Forbes Business, 43 percent of millennials value authenticity over content. Finally, millennials are known as the social media generation. Your social media presence is of high priority to millennials. In fact, 62 percent of millennials claimed they would become a loyal customer if a brand engaged with them on social media. However, also keep in mind that you need to show authenticity before millennial agents will be willing to take the next step. It’s also important to show these younger agents that you are focused on their generation. If you already have millennial agents on your team, highlight their accomplishments. Blog and social media posts on sites like Facebook and Instagram are great ways to show the inner workings of these individuals in your company. It also ties back to building the authenticity of your brand. If millennials can see others their own age succeeding in your company, they’ll be more inclined to consider working with you. Whether it’s a scholarship for business or marketing classes or training seminars on the newest technology, millennials are serious about pursuing educational opportunities. If you’re not able to offer full ride scholarships to business school, consider hosting guest speakers to teach millennials some of the best ways to brand their image or inform them about the most recent Facebook algorithm updates. Homes.com partners with Secrets of Top Selling Agents to create free webinars for agents, inviting experts to discuss multiple facets of real estate from FSBO listings to video marketing. Consider promoting the most recent Secrets webinar, with Coach Jackie Leavenworth, to show millennial agents you’re serious about meeting their educational needs. Millennials are known for being tech-savvy. In fact, 87 percent of millennials juggle two to three different tech devices in a day. Because of this, most want the ability to work and keep in contact while still being on the go. 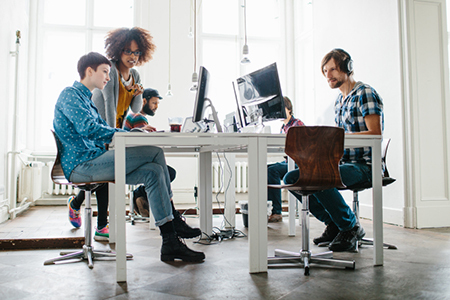 Companies that support the growth and use of technology will be ideal for millennial workers. In addition to promoting the latest devices, millennial agents also want technology that they can use to work with buyers and sellers. Show them that your company is on top of the current technology trends for social, video and other online marketing. By creating company accounts for up-and-coming technology platforms, such as Periscope, and keeping them updated, millennials will see that your brokerage is as technologically savvy as they are. To show them that you’re serious about helping them connect with clients through different social platforms, consider investing in Homes.com Social, a comprehensive social media solution designed specifically for real estate to help you engage with homebuyers and sellers and drive more leads. Hard-working and career-driven, millennials are a great addition to any real estate team. Since the market is shifting toward connecting with buyers and sellers from the same generation, these new agents can form close connections and bond with those in their age group.